The driver of a dirt bike died Friday night in a crash in Lake Worth. 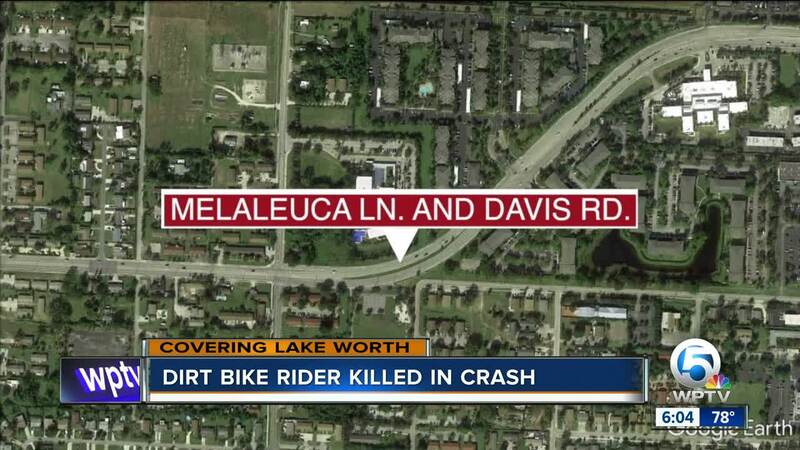 LAKE WORTH, Fla. -- The driver of a dirt bike died Friday night in a crash in Lake Worth. The Palm Beach County Sheriff's Office says 23-year-old Juan S. Salazar of Lantana was unlawfully traveling eastbound on Melaleuca Lane on an unlicensed and non-street legal dirt bike at 10:08 p.m. Friday. The driver of a 2009 Jeep SUV was traveling westbound on Melaleuca Lane and turned left onto Davis Road to head south. The front of the dirt bike impacted the right rear of the Jeep. Salazar was ejected from the bike and impacted into the Jeep. He was not wearing a helmet and the bike was not equipped with safety equipment such as lights or mirrors. He was transported to St. Mary's Medical Center where he died from his injuries.